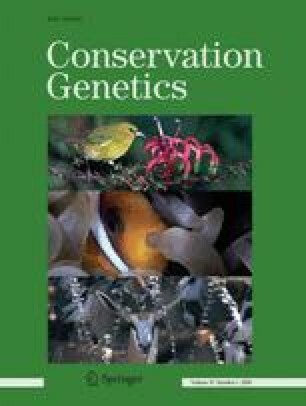 Detection of hybridization and introgression in wild populations that have been supplemented by hatchery fish is necessary during development of conservation and management strategies. Initially, allozyme data and more recently highly polymorphic microsatellite markers have been used to obtain this information. We used both markers to assess the effectiveness of four assignment methods (Structure, NewHybrids, Baps and GeneClass) to detect hatchery introgression in wild stocked populations. Simulations of hybrid genotypes from real parental data revealed that the number and type of markers used with Structure, NewHybrids and Baps can identify as admixed most first and second generation hybrids as well as first generation backcrosses. In wild populations, introgression rates estimated from different markers and methods were correlated. However, slight disagreements were observed at both population and individual levels. Overall, the fully Bayesian (Structure, NewHybrids and Baps) performed better than partially Bayesian (GeneClass) assignment tests. In wild collections, Baps analyses were limited because of the lack of a native baseline. In all cases, the efficiency of methods was reduced as introgression increased. This research meets the objectives of the REN-2003–05931/GLO project of the Spanish MCYT. R. Fernandez and M. Vera were fellows of the Spanish MCYT. We thank FM Utter for English revision and for valuable suggestions to improve this manuscript.